More satisfied patients, higher reimbursement, less stress. Patient satisfaction has become increasingly more important to hospital organizations as reimbursement metrics have incorporated these ratings. Research has demonstrated that medical professionals who communicate with empathy have higher patient satisfaction ratings. (Riess, 2012). In addition, clinicians who are able to communicate well with their patients improve the patient experience, which will ultimately lead to improved clinical health outcomes. With the implementation of the Affordable Care Act, reimbursement metrics have changed for hospitals to now incorporate patient satisfaction ratings. Communicating with empathy will lead to higher patient satisfaction, which in turn leads to adherence to treatment regimen and better clinical health outcomes. For an average-sized community hospital, this could equate to nearly $9 million in reimbursement. Empathic clinician communication improves the quality of all interactions with others; patients, their families, colleagues, and loved ones. (Halpern, 2012) In addition, a key component of the patient experience is the cohesion of the healthcare team and how well they communicate with each other. Good communication between colleagues working at a hospital will lead to better coordination of patient care. 82% of medical malpractice claims are the result of a breakdown in communication. This can include poor physician attitudes, communication failures, disparagement, and unrealistic expectations. 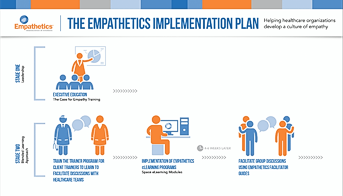 Empathetics eLearning programs can improve patient satisfaction, while reducing the likelihood of medical malpractice claims.